DrawPad Plus is a fully featured graphic design program. Easily draw and create graphic images such as banner ads, invitations, paintings, and much more! Features include pencil and brush tools, raster and vector images, image layers for non-destructive editing, and effects such as bevels and shadows. Editing features include crop, rotate, resize, and flip. DrawPad also supports png, jpg, gif, pdf, and svg formats. DrawPad Plus is a fully featured image composition and manipulation program, and an essential tool for all types of graphic design projects. Key features include pencil and brush tools, raster and vector images, image layers for non-destructive editing, and effects such as bevels and shadows. With the easy to use interface, you'll be able to immediately get working on your next project. 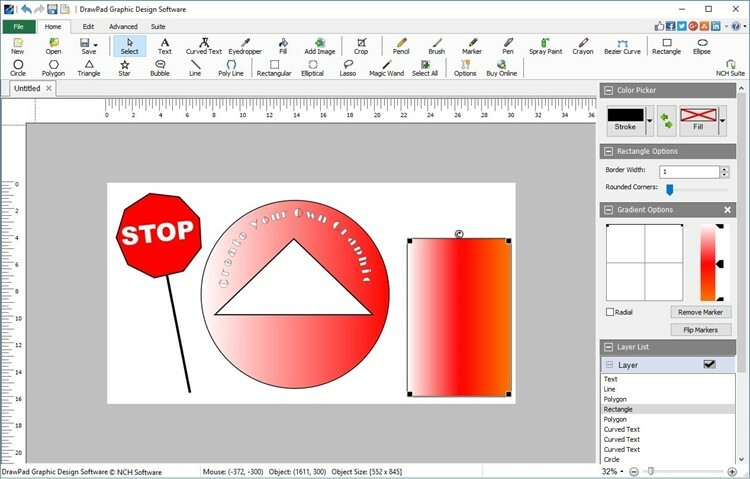 Create banner ads or invitations, make sketches and paintings on your computer, draw diagrams, icons and other web graphics, and more with DrawPad Plus. Insert shape objects, including circles, rectangles, polygons, stars, word/thought bubbles or insert text. Fill areas with solid colors, gradients, patterns or textures. Editing features include crop, rotate, resize, and flip. DrawPad also supports png, bmp, jpg, gif, pdf, and svg formats.